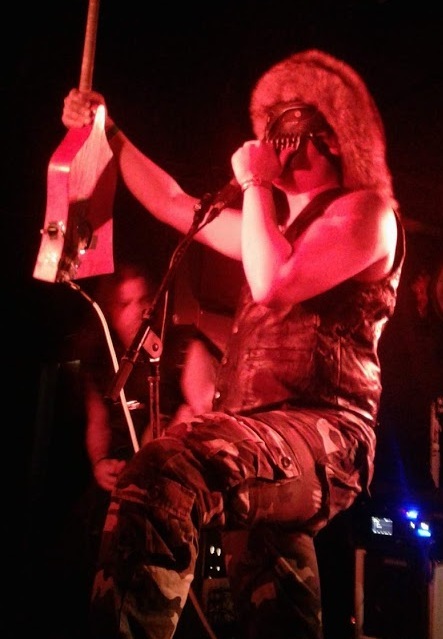 Tengger Cavalry are a New York based band that mixes metal with the sounds of traditional Mongolian folk music. Fronted by Nature Ganganbaigal, the band has been going since 2010 and have been making a bit of a name for themselves in recent years, even playing a show at Carnegie Hall back in 2015. The band’s current tour, which sees them splitting things up into a more “acoustic” set followed by a full on metal set, saw them taking the stage at Hard Luck Bar on Friday night. With all of that in mind, I was slightly confused when I walked in shortly after the band had started the opening set to find them playing music that was far from acoustic and didn’t quite seem like the more traditional take on Mongolian folk music I expected. I wondered if maybe I’d been misinformed and these dudes were just skipping to the metal from the get go. After all, every member of the band was already sleeveless – how much more metal could they get? The next number however, veered much closer to traditional sounding, though they still mixed it up a bit throughout the set, even throwing an improvised blues jam into the mix. “We’ll see how it sounds on this instrument,” said Ganganbaigal, referring to the morin khuur, a traditional Mongolian instrument that he played throughout the night.